Post Office bellbox, Shenley Road, Borehamwood, Hertfordshire, 2014 (photos by Alex Gilmore) • In 2014, Andy Gilmore sent me this photo (taken by his son Alex), of a type of box I had never never spotted, even though I once photographed some shopfronts in this very road. 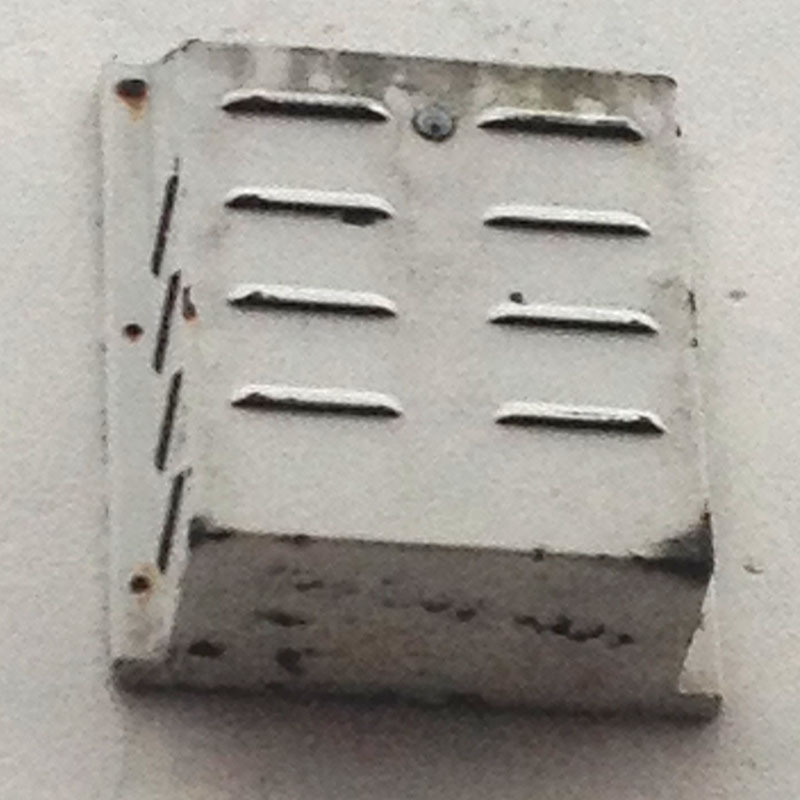 Andy said: “This is one of a few types of bell box that the Post Office used to fit. All Post office Systems were installed by Romec (Royal Mail Engineering Company). 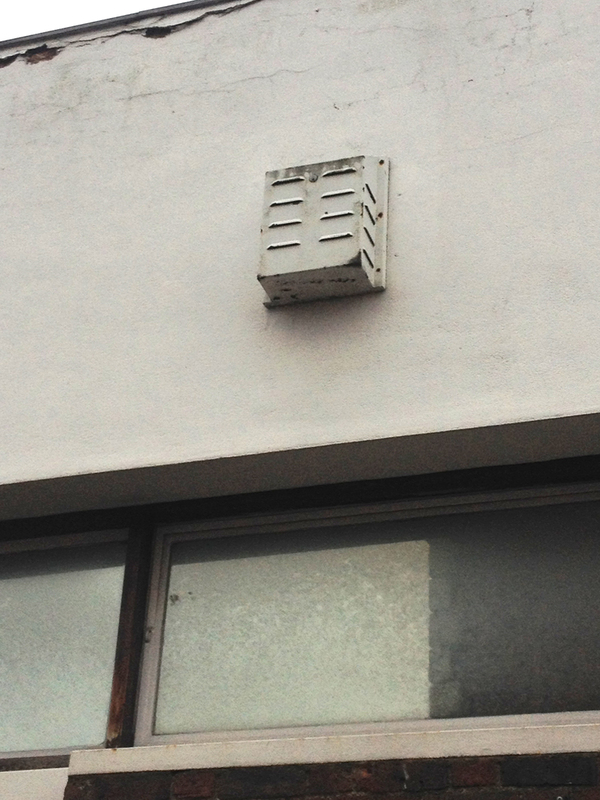 Romec only used to install alarms for the Post Office – internal client if you like. A few years ago they went commercial and do the likes of Comet/PC World, but still do Post Office Branches and sub branches.” Below we see it in wider context. Wow at last the Post Office box which I believe is the longest used box starting in the 60s. Well done Vici but it’s not exactly the one I’ve been harping on about for years, this one is white which is just an extension bell, the original and main bell box is a browny gold colour from memory. I’m sorry to correct you but the original alarms were fitted by GPO electricians which had it’s own alarm department, I transferred to this department around 1968 as an electrician and stayed in the security industry until I retired in 2009. In these early days they were fitted in main post offices, sub post offices, main sorting offices, some telephone exchanges and a few secret buildings which obviously I can’t name. Later in the 70s Shorrocks started fitting the alarms in sub post offices and I would believe that the post office electricians continued fitting alarms until Romec was formed in 1989. Yes Stuart it is a lock on the box which would you believe exposed to all the weather conditions never gave any problems. Is that a key operated lock at the top there? You can see another rare type on Cheddar local delivery office (not the actual post office in the High Street – that’s a plastic Romec one) which looks a bit like an early version of the MDT I used to use (look on here for the Casa Security box).